In the spring of 2016 I walked more than 400 km along the two main Portuguese Way of Saint James (Camino de Santiago) pilgrim routes between Porto and Santiago de Compostela. I have followed the well-trodden Central Camino Português and the various stages of the quieter Coastal Camino route. At times I walked alone but mostly this was with a friend. By sharing my experiences, insider information and research, I aim to help you decide whether walking the Portuguese Camino is the right walking holiday for you, which route to take and how to prepare for such an adventure. I may also be able to help you work out your itinerary – get in touch. 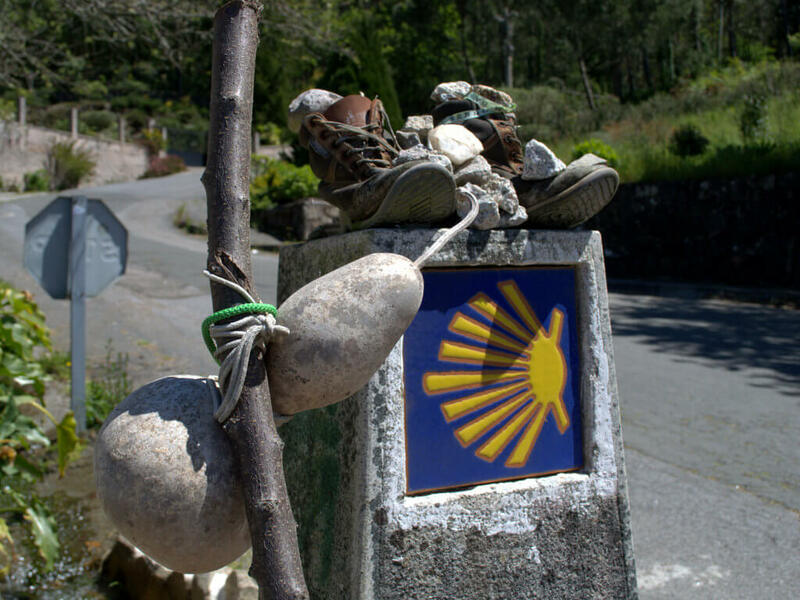 Who was Saint James and what is the Camino de Santiago? How long is the Portuguese Camino and how many days does it take? What’s the best time of year to do the Camino? Do you need to use a guide for the Camino? Can you walk the Camino alone? Should you choose the Coastal or Central Portuguese Camino? There are many Caminos de Santiago, depending on which country and town/city you start from. The two main routes from Porto are the Central Way and the Coastal Camino. The best Portuguese Camino route for you will depend on many factors, not least the season and your capacity for walking uphill. Both routes have some hills but only the Central Route has a small mountain to climb. The views are worth the effort. Although the idea of walking by the ocean sounds appealing, strong winds from the Atlantic can make the Coastal Route more tiring than it needs to be. It’s important to understand that, despite the name, this route is not all by the ocean, in fact most of it is inland. The more established and well-trodden Central Camino takes you from one historic town or city to another with plenty of beautiful scenery and tiny villages in between. And that small mountain I mentioned. How long is the Portuguese Way? If you start your Camino in the World Heritage city of Porto, the full distance to Santiago de Compostela is 240 km (149 miles) along the Central Way or 260 km (161.5 miles) on the Coastal Way. That said, I’d recommend skipping the first 13-17 km (8-10 miles) unless you relish the thought of walking through busy urban and industrial areas. If you book your Camino through the tour operator I work with, they will transfer you to the outskirts of Porto. How long does it take to walk the Portuguese Camino? If you are able to walk an average of 20 km (12.5 miles) per day, you can do either route in around 2 weeks but if you can, allow 3 – I’ll explain why. You need a minimum of 12 actual walking days for the Central Route and 13 for the Coastal Route but don’t forget to factor in transfer times to Porto and from Santiago de Compostela when setting dates. You should also give yourself at least a full day to explore Porto and another to enjoy Santiago de Compostela so at least 2 nights in each city. If you are walking independently and using the albergues (pilgrim hostels), you will have slightly more flexibility about where you stop but when using the services of a tour operator, the stages end where there is suitable accommodation, i.e. at least a 2-star hotel. For this reason, some stages are shorter than others but they average out at around 20 km (12.5 miles) per day. These maps show how each route is normally broken into stages. If you can spare the time, I would also suggest walking shorter distances where possible. I found that up to 15 km per day is enjoyable, 18 km is bearable, 20 km is just about okay but beyond that it can be a bit of a slog, especially on a hot day. Sometimes, because of where accommodation is, you have to push on beyond your ideal daily limit but since this is no ordinary walking holiday, it’s worth taking your time over. There are other ways around this involving taxis to skip the beginning or end of a stage or to break a stage over two days if you don’t want to miss a single step. For more insights into these places, read my experiences along the Way. April, May and June are the best months for wild flowers and warm weather, although you may get some rainy days. May is a particularly popular month so plan and book ahead. July and August are far too hot to be doing this kind of extended walk, although people do. If this is the only time of year when you’re free, be sure to get very early starts, protect yourself from the sun and stay hydrated. By September, the temperatures should be more bearable, plus the vines will be ready for harvest. This is another very popular month. After October, your chances of cold, wet weather increase but the routes are open all year. That said, high winds and grim weather make the Coastal Way unpleasant in winter so if this is the only time of year you can do it, I’d stick to the Central Way. There are hostels, a.k.a. albergues, along the route where you get a bunk bed in a massive dorm room with anything from 30 to 60 other people on a first come, first served basis for about 6 euros. They do offer plenty of opportunities to meet fellow pilgrims but I wouldn’t recommend them if you actually want to sleep. Although ‘lights out’ is around 10 pm, there will inevitably be someone in the room who snores like a freight train and I’ve heard tales of all sorts of shenanigans that may keep you awake. Even if you manage to sleep through that, be prepared for an early start. Because you can’t usually book a bed, fellow pilgrims will be up before dawn and ready to get a head start. I stayed in hotels, arranged through a partner tour company, so I knew in advance that I had a comfortable bed for the night and decent en suite bathroom facilities that I only had to share with my friend. They also transferred my suitcase each day so I only had to carry essentials. If that level of comfort appeals to you, click here to get in touch and I’ll arrange for a quote. Exactly what to pack will largely depend on whether or not you intend to carry it around with you. My back hurts at the best of times so that was never an option for me – I used a luggage transfer service and just carried water and the bare essentials with me as I walked. I have done my research though, and learned from experience. For various reasons, I did my Portuguese Caminos in three separate episodes. The first of these was 4 days on the Coastal route, followed by a 10-day stint on the Central Route and a ‘mop up Camino’ of the remaining stages of both routes. Because of this, I was able to learn from my mistakes and each time I set out better prepared and equipped. Here’s my advice on how to prepare yourself physically for such a long walk. Do you need a guide to walk the Portuguese Way of Saint James? The routes are very well-marked and if you have a decent guide book and/or instructions with you, it isn’t necessary to have a guide. You will probably enjoy the experience more if you have a friend or loved one with you to keep you moving forward when the going gets tough. Between you, you will be able to find your Way, although it is possible to arrange guided Caminos if you prefer. Is it safe to walk the Portuguese Camino alone? I have always felt safe when travelling in Portugal and Spain. I walked some stages of the Portuguese Caminos on my own and had no concerns about being a woman walking alone or about being robbed. There was only one short stretch on the way into Vigo that looked dodgy enough for me to put my camera away. Even so, I don’t think anyone wants to run the risk of intentionally harming a pilgrim – who knows what punishments might await them! Should you need help when you’re walking, don’t be afraid to ask – people are usually more than happy to oblige. If you arrange your self-guided Camino with a tour operator, you will have the security of having a local contact number should you run into difficulties or have an accident.